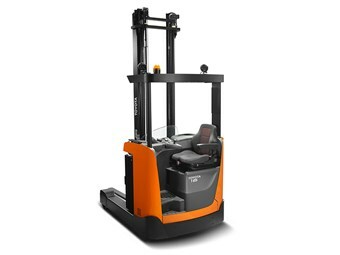 Toyota Material Handling Australia's 8FBRE Series. Forklift manufacturer Toyota Material Handling Australia (TMHA) has launched the 8FBRE Series, a new electric reach forklift range. The new narrow aisle battery-electric range has a lifting capacity ranging from 1.2 to 1.6 tonnes and a maximum lift height of 8.5 metres. An addition to the company’s 8-Series battery-electric and internal combustion engine forklift range, TMHA national sales and product manager Jim Lobow says the new reach trucks are designed to be simple and practical tools. "Many of our customers carry out a range of tasks over the course of their working day," Lobow says. "We see this new range of reach trucks being well suited to small to medium sized businesses who would typically use the forklift during a single shift operation." The 8FBRE Series feature fingertip control levers, a car-like pedal layout, electronically controlled 180 degree or 360 degree steering and customisable ergonomic options. "The seat and steering console are fully adjustable by the operator, and the height of the cab floor can also be adjusted to three different positions if required," Lobow says. "Operators can also customise the settings for maximum speed and acceleration, automatic braking and steering sensitivity." "Another feature is the regenerative braking technology that transfers brake energy back into the battery to provide extended run times between charging and help reduce operating costs," Lobow says. The new forklift range also includes PIN-code start-up, automatic parking brake, clear view mast and overhead guard, emergency cut-off and electronic speed control. Tilting forks are available as an option.